This has been an interesting summer of agate hunting in Grand Marais. There is more rock on the beach than there has been in several years. Despite the number of beach pebbles, there have not been as many agates brought into the museum as I expected. Perhaps people are finding them, but not just bringing them in. However, I have seen some great agates. Jill Haldeman found two nice agates in the Grand Marais area. One agate has nice feathered fortification structure. The other has some of the most bizarre eyes I think I have ever seen. James Lloyd, from Northville, MI, found a beautiful red and white agate in Grand Marais. His chosen hunting technique is to “swim” across the rocks on his belly scooping and digging as he goes. He dug down several inches to get this beauty. He is pictured with his kids, Ava and Auden. Kurtis Kares from Mears, MI found several agates in the central and eastern U.P. He is especially fond of the Eastern U.P. water-washed agates. 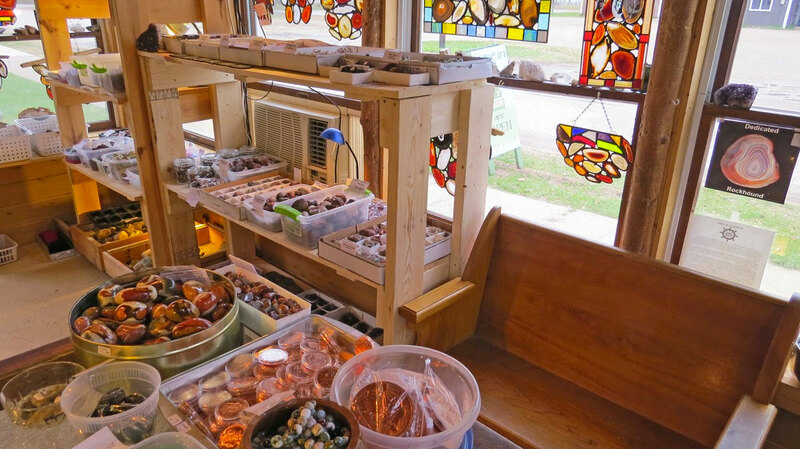 The last agate was found by my friend, Claudia, who stays in Woodland Park with her husband for most of the summer. She came by the museum to show me this cool agate she found yesterday. It is not the biggest in the world, but it has awesome structure and extremely nice color. Congratulations for all the great agates!!! !